The day is Halloween. Also today. 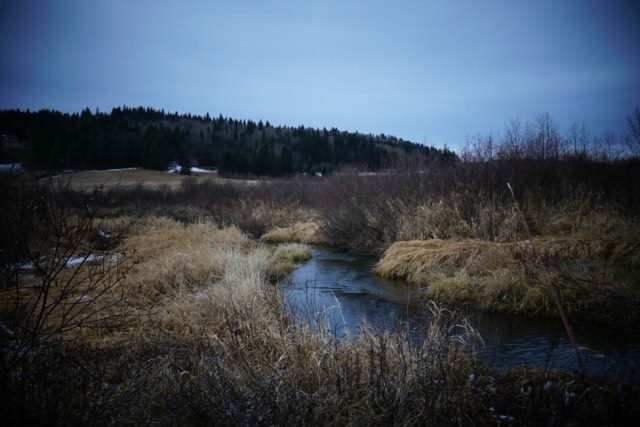 is the final day for fishing in the high country streams of Alberta. It is a monday, and I should be at work. But I am not. I am at home, bored out of my mind, hooked up to an IV unit and wondering why I am struck by poor luck when it comes to getting these obscure and random injuries. I sit in my living room and bend my sore and infected elbow and wince a little bit with the pain. I look down at the needle and IV tube stuck into my left arm; seeing the bubbles pulse as a dose of antibiotics flows into my veins. The drone of the take home IV pump unit the hospital gave me whines in the background of my quiet house; a constant humming, every 5 or so seconds. I knew it would be irresponsible to drag a $3000 dollar medical pump out fishing with an IV needle stuck into my arm. And i was supposed to be resting my elbow, which also happened to be my casting elbow. 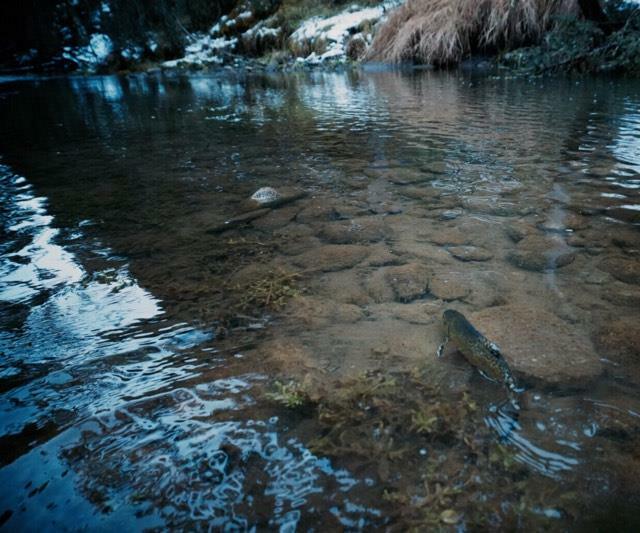 I had already resigned myself to the fact that I would not be fishing any small water until next year. And that the beautiful brown I had caught a few days earlier would likely be my last. Ahh, what the hell. I thought as I grabbed my IV unit and headed for the front door, with a mug of coffee and a couple of advil. You see, the strange rationalization process described above is what I have come to call “Late season Physcosis,” an affliction affecting anglers around the world as the season comes to a close. 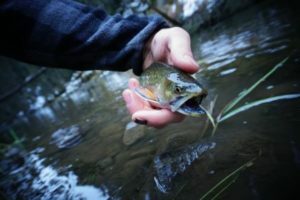 A process whereby the daunting thought of a long winter can lead to anglers creating an alternate reality in which catching ‘one more fish’ literally becomes the only thought they are capable of manifesting. 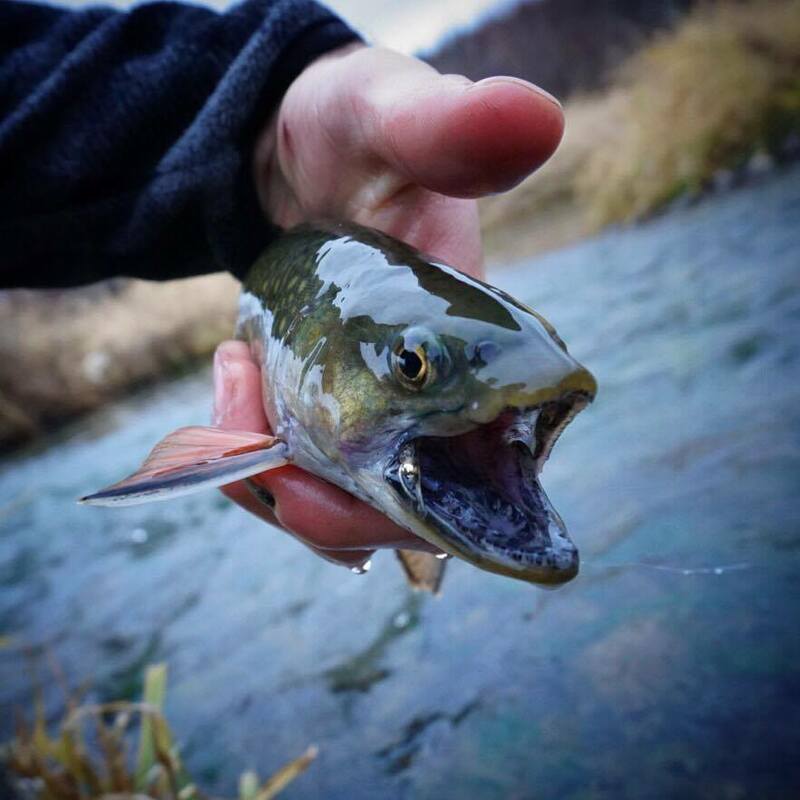 Case and point: I spent hours trekking deep into my creek a few days ago just to catch ‘one more fish,’ which I did, and I told myself I was happy with that being true. It only took a single day before I was once again back on the river in search of ‘one more fish,’ hacking and slashing away and neglecting my other responsibilities. This is an affliction I’m sure you are all familiar with; we, as anglers, are pretty deranged. And this is the time of year when we get especially anxious about having to come face to face with the fact that our ‘one more fish’ might not be for another 6 months. So, despite being pumped full of antibiotics and carrying around a little backpack with a bag of drugs and an expensive medical unit and a sore casting arm, I was in the car this morning making haste to that one pool beside the road that I was sure I could catch a fish in. I didn’t even bother putting on pants or waders. Just went out in my shorts and sneakers like it was the middle of summer. I had one goal in mind: One more fish. And luckily for my physcosis, I got to say that many times as the little brookies gobbled down their halloween candy all morning and I sneaked around what may or may not be private property with my IV bag and fishing rod. Turns out, I didn’t catch that one fish in that one spot underneath the tree in the hole right by the highway that I had been dreaming about. That would be too perfectly poetic and kind of corny. The type of thing that only happens in Jim Mclennan books and on Instagram. I came close to that kind of fairy tale story. 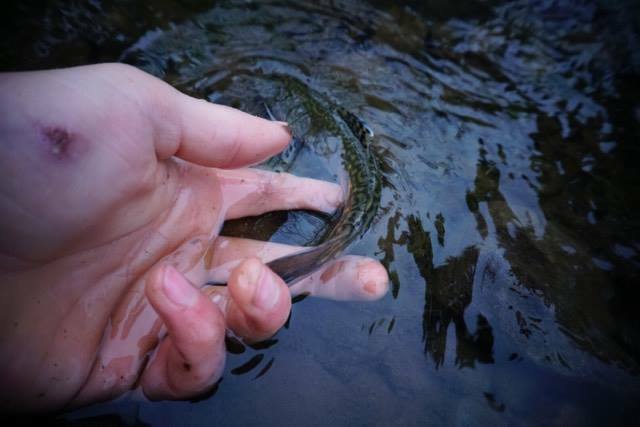 I hooked him on my first cast in the pool, but just like the first two times, he shook my hook and floundered back to safety. But this was a blessing. Becasue I countinued further into the willows in my pursuit for one more fish, and despite my freezing legs and feet, I was able to catch 8 brookies, and I think I dealt with my physcosis permanently. Thanks for reading! With the closing of most of our streams, and the snow up on the mountains, it is certainly time to start thinking about the winter and skiing. 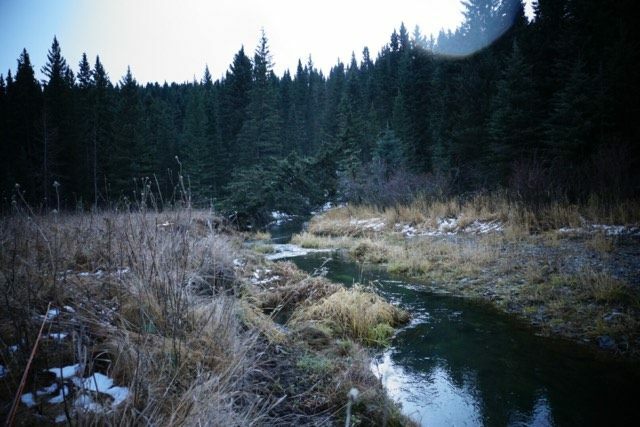 There is, however, some good streams in Alberta still open to fish (the Bow!). It’s been an awesome year of Bushwhacking, thanks to everyone who showed there support! There will likely be a final blog post coming soon about winter fishing, and what to expect from us through the winter and into next season! Thanks to you all and Happy Halloween! This time of year can be tough. I’ve been trying to get out as much as possible here before things ice up here and it’s been paying off nicely. I’m glad we don’t see any closures like that here in the Okanagan. It just gets tougher to find fishable water. It’s possible, though, if you know where to look.